Click below to jump to a FAQ section. Who do I call about an Invoicing Error or a Credit Question? How do I open a credit account with Elliott Electric Supply? Why are the "Account," "Quotes," & "Custom Lists" menus not fully available? Can I set up an Elliott Electric Account to have access online? Please call your Credit Representative if you suspect an invoicing or billing error, or if you have any Credit-related questions. You can find your Credit Representative's contact information on your Account Overview in the section labeled "Contacts." When you place an order online, it is immediately printed in our warehouse. Shipping times vary by location. You can check shipment status on the Recent Orders page by selecting an order (do this by clicking an order number in the leftmost column). Selecting an order will open the Order Details page. Find the Shipment Information section on the right of the page. There will be a listing of each shipment on the order, with the corresponding Ship Date and Status for each shipment. Click a shipment number to view the included items and additional information, like the tracking number (if applicable). Download, complete and fax the credit application to the Credit Department. Click the Forgot Password link at the top-right of any page, or directly from the Login page. You will be taken through the password recovery steps. When you are not logged in these features are not available. For full access to these areas of our website, please login. If you haven't registered for an Elliott Online Account, you can Register Now, or browse these features using our Demo Login by clicking the Login for Demo link found at the top-right of any page (in the site navigation header). Certainly! Click the Register link located at the top-right of any page, directly above the 'Login for Demo' link (see image above). Do I have to select a Location before I search the Products section? How do I view products/inventory from a different store location? Can I order items from more than one Location? How current are the "Stock" levels? What are "Cross Referenced Items?" No. You no longer have to specify your location before searching for products. The site's search tool will automatically choose the best location for you if you are not logged in. However, we do recommend that you login before searching, for several reasons. In addition to displaying your special pricing and synchronizing your Custom Part Numbers and Lists with our Products section, logging in will ensure that you automatically see real-time inventory numbers for your primary Elliott store. This provides you the highest level of convenience, and you can always view stock levels from a different store location by using the Change Store option from any search results page. Elliott Electric Supply has over 100 locations with inventory, and all stock levels shown on the website are in real-time. For this reason, it's highly useful to have an online Elliott Account, even for customers who only make cash transactions, so that your primary store location used by our Products section is as close to you as possible—giving you the most efficient delivery or pick-up available. From any search results page in the Products section, click the "Change Store" link above the search results on the right. The "Change Store" link will open a search page for finding a store. By default, all Elliott regional hubs will be shown. You may select one of the regional hubs, or use the search bar in the middle of the page to find any Elliott store location. Yes. You may change locations at anytime while browsing products, in order to check item availability at different stores or regional hubs (see How to Change Stores above). Once you have added items to your Cart, click View Cart at the top-right of any page. The items in your Shopping Cart will be arranged according to which Elliott location(s) will be shipping them. All stock levels listed on our website are live. This means you see exactly what's available in our warehouses and regional hubs in real-time. When you place an item into your Cart, you may notice that the 'stock available' number doesn't decrease. This is because stock quantities are only updated after the order has been placed and the purchase completed. This is overstock inventory that is being sold at a discount. Similar Items are potential substitutes for the item you are currently viewing. They may be from the same or different manufacturers. If we do not offer the brand you're looking for, our "Cross-Referenced" items offer equivalent products from different brands. Accessories are products that are typically purchased along with the item you are currently viewing. Where can I enter a note to Sales about my order? How will I know that my order was received at the store I selected? Order Status: What does Back Order, Processing, and Shipped mean? Can I reorder a previous order? Where can I enter a note to my Salesperson about my order? You are given an opportunity to enter any special notes, comments, or instructions for your order during checkout. After you place an order, you will receive ONE email stating the order has been received by our system. After this initial email, if you have orders from multiple locations, then you will receive status emails from each location that will be shipping your items. Login and open the Recent Orders page (Account Menu > Purchase > Recent Orders). Search for your order or select it from the list by clicking the order number. Selecting an order will open the Order Details page. Find the Shipment Information section on the right. There will be a listing of each shipment on the order, with the corresponding Ship Date and Status for each shipment. 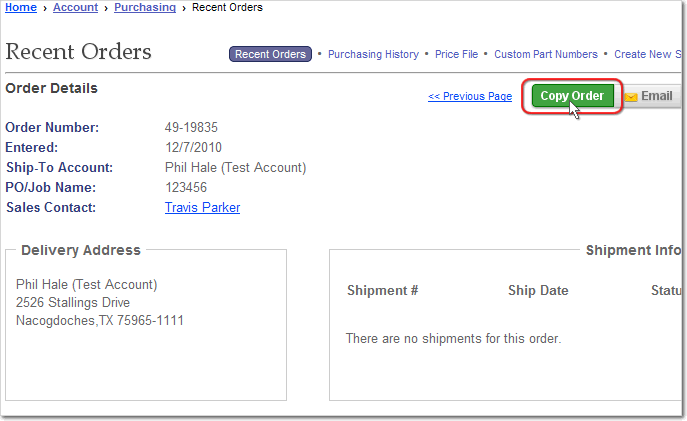 Click a shipment number to view the included items and additional information, like the tracking number (if applicable). Each possible shipping status is discussed below. Back Order - The item is on back order. You may cancel the order or wait for the manufacturer's next shipment. Processing - The item is scheduled to be picked from inventory and you may cancel it at any time. Shipped - The item has shipped. A tracking number may be available, depending on the method of shipping. Yes. Login and go to the Recent Orders page (Account Menu > Purchase > Recent Orders). Search for your order or select it from the Recent Orders list by clicking the order number. Once you have found and selected the order, the Order Details page will load. On the Order Details page, click the Copy Order button at the upper-right. Your items will be added to your Cart and you may Checkout when you are ready. Where can I see an overview of my account? Where can I see an overview of individual Sub-Accounts? Where do I change my subscription settings so I can start receiving specials and catalogs? I need to change my password, address, and/or company information, where do I go? Where do I set up new Sub-Accounts? What are Counter PINs and where can I set them up? Don't see what you're looking for? Try the Account Settings Help Page. Login and select Account > Overview, or simply click the word Account on the blue navigation menu at the top of any page. This will take you to the main Account Overview screen, which provides an overview of your account. On it, you will find comprehensive information for your main account, in addition to details on each Sub-Account. On the main Account Overview screen you will a Sub-Account summary at the lower-right of the page. Use the drop-down menu provided to select the Sub-Account you would like to use. All of your Elliott Subscriptions can be managed from your Account Settings page. To get to your Account Settings, login and select Account > Settings from the main site menu. Select Update Subscriptions on the Settings page. You can choose to receive the Elliott Electric Supply Catalog, delivered twice per year, as well as the monthly Electric Times by mail and/or email. Make your selection and provide any necessary addresses or contact info. Login and go to your Account Settings page. Login > Account > Settings > Select the setting you would like to change. Counter PINs are an added security feature available to all Elliott Electric Supply Account holders. You may enter PINs for individual employees, and when that employee makes a purchase at the counter (in our stores), they have to present their PIN. Counter PINs are not accessible by Elliott Electric Supply employees and must be maintained by the main account holder online. Counter PIN Numbers can be managed from the Account Settings page. Login and use the main site menu to navigate to Account > Settings. How do I pay my Invoice(s) Online? How can I see when and where my payments were applied? Where can I view all of my Unpaid Invoices? I need to find an old Invoice, where do I search? I use Quicken, Quickbooks, or PeachTree, can I download my Invoices into my software? I want to receive my Invoices via email, fax, or mail, where do I go? Does Elliott Electric send Invoices via EDI? How do I get started? Don't see what you're looking for? Try the Account Payables Help Page. Follow the steps that appear on screen to make your payment. You'll be able to review the payment details before it's finalized. 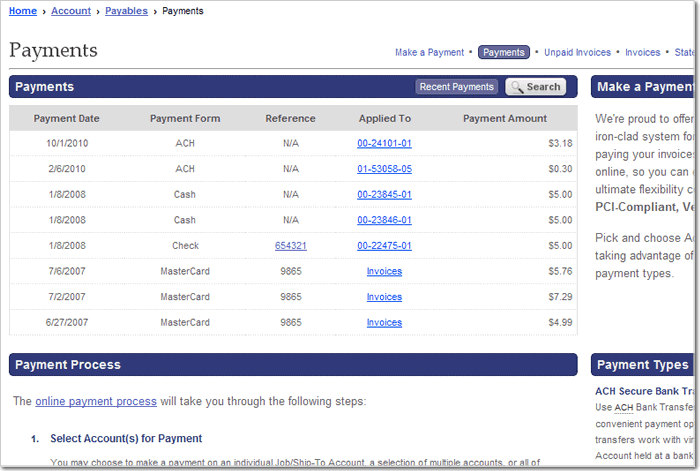 Select a payment from the "Recent Payments" list by clicking any item in the "Applied To" column. This will open the Payment Details window, which shows each invoice paid by the selected payment. Click an invoice number to view the invoice details. Select a payment from the search results by clicking the link in the "Applied To" column (this will either be an invoice number or the word "Invoices"). The payment details will appear, showing you when and where the payment was applied. The Unpaid Invoices page allows you to list, sort, and view your unpaid invoices in detail. There are two drop-down menus at the top of the page. The first one lets you choose which invoices are displayed: All Unpaid Invoices, Unacknowledged Invoices, or Acknowledged Invoices. The second drop-down, labeled Accounts, lets you view unpaid invoices for any of the following: an individual Sub-Account, all Sub-Accounts, or all open Sub-Accounts. Be sure to click the Display Invoices button after altering either of these drop-down menus. Click an invoice number to view its information in detail. You may change an invoice's PO/Job Name by clicking the (Edit) link next to it in this main list. Other options for working with Unpaid Invoices include Email/Print the complete list, Email/Print/Fax any invoices you select, as well as Download, Dispute, or Acknowledge any invoices you select. You may narrow your invoice searches by selecting a Sub-Account with the drop-down menu at the top. You may search by date range, invoice number, or PO/Job Name. I use Quicken, Quickbooks, or PeachTree, can I download my Invoices to my software? If you need help using the Unpaid Invoices page, see the Unpaid Invoices FAQ. Use the checkboxes to select the desired invoices from the list, then click the Download link above the list. Follow the instructions to choose your preferred software and proceed to downloading the invoices you selected. 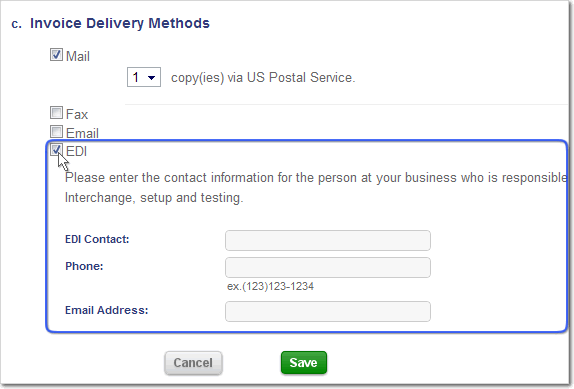 At that bottom of the page, in the Invoice Delivery Methods section, there is a checkbox option for EDI. Click the checkbox to enable it and enter the required information. If you need additional helping setting up your EDI support, contact our Help Desk at 1-888-569-7181. I want to review my past purchases. Where do I view my Purchasing History? I placed an order recently. How can I check the order status? Does Elliott Electric Supply support EDI? How do I get started? Don't see what you're looking for? Try the Account Purchasing Help Page. You will see various fields that you can modify to customize the report. Select one or all of your Sub-Accounts, specify a date range, and pick the location where the purchases were made (you may choose "All"). The remaining fields are optional but can be used to narrow your results. Selecting an order will open the Order Details page. Find the Shipment Information section on the right. There will be a listing of each shipment on the order, with the corresponding Ship Date and Status for each shipment. Each possible status is discussed above, in the "Online Orders" FAQ section. For additional EDI support, contact our Help Desk at 1-888-569-7181. What is the difference between an "Elliott Quote" and a "Pending Quote?" Where do I go to create a new Quote? I have an old Quote and would like to resubmit it. Where do I add additional items to my Quote? I submitted a Request for Quote (RFQ), how do I check its status? How do I search for an old Quote? How does the Quotations process work? Don't see what you're looking for? Try the Quotations Help Page. An RFQ is a Request For Quotation. When you create a quote and submit it as an RFQ, it goes to your Elliott Sales Rep for approval and will return to you as an "EES Quote" with special pricing. An "Elliott Quote" or "EES Quote" is a quote that was entered by an Elliott Salesperson. The quotation may be negotiated over the phone, in person, or created online on your account and submitted as an RFQ. While an RFQ is under your Sales Rep's review, it will appear online as a Pending Quote. 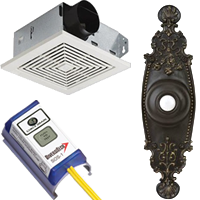 Once approved, it is an "EES" or "Elliott" Quote with special pricing. These quotes are non-modifiable. A "Pending Quote" is a quote that you built online. If the quote was submitted as an RFQ and it shows up as a Pending Quote while it is being processed by your Elliott salesperson. Pending Quotes can be modified, deleted, or saved for future use. Login and click Quotes on the main menu. 1. Enter your items in the Rapid Entry form on the right side of the main Quotes page. (Rapid Entry is also available on the homepage and the Products main page). 2. Click the green Create Quote button located on the top-right of the main Quotes page. 3. Add items to your shopping cart from our Products section and then view your cart. In your shopping cart, click the Save to Quote button and a new quote containing the items will be created. You may submit the quote as an RFQ. Login and go to Quotes. Use the Quotes search tool (at the top) to find the old quote, or select it from the "EES" or "Pending" Quotes list. On the Quote's Details page, click the Copy button located directly below the quote name. This will open a pop-up window with two options. Select Copy this Quote and press continue. This will create a new copy of the quote with a new quote #, allowing you to give it a new name, edit it as necessary, and resubmit it as an RFQ or save it for future use. Additional items can ONLY be added to a "Pending Quote." Open the Pending Quote (Login > Quotes > Search or Select from list). On the Quote Details page, click the Edit this Quote button (below the quote name). This will open the Edit Quote page. Click one of the two links in the top-right corner, Add Items via Rapid Entry or Add Items from Online Catalog. You can then proceed to adding items. Contact your salesperson, whose name will appear on the quote details page in the "Quote Information" section. 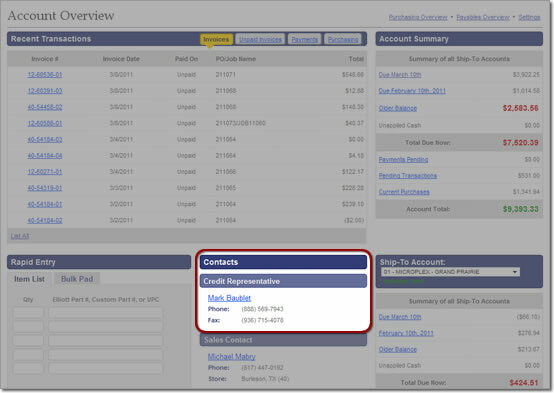 Your salesperson's contact information can be found on your Account Overview in the section labeled "Contacts." Select a search method and enter your search criteria. You may also find the quote you're looking for in one of the Recent Quotes lists (EES or Pending Quotes) on the left side of the page. How does the Quotes process work? How do I add items to a Featured List? How do I add items to a Custom List? How do I create a new Custom List? How do I copy a Custom List? I want to add/modify/delete items on a Custom List, where do I go? Don't see what you're looking for? Try the Custom Lists Help Page. These are item lists that you can create and maintain using items from our Products section. 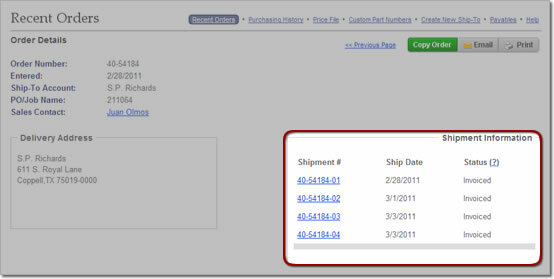 Custom Lists make it possible to save frequently needed orders or sets of items for future use. Custom Lists can only be accessed if you are logged in to your account. When logged in, you are able to create and modify your lists, copy them, and create orders with them. Previously called "Common Lists," these are lists created and maintained by Elliott Electric Supply, available for your convenience as soon as you open an account. Featured Lists are meant to serve as a starting point for your custom lists, providing some of the more common sets of items ordered from our website. If you are logged in, you can copy a Featured List and then customize it however you like. On the main Custom Lists page, click the Copy Existing List link at the top-right. Next, select the Featured List you would like to copy, modify, or add items to. The following page will let you pick and choose which items you would like to copy. Use the checkbox in the header at the top of the list to select all of the items at once. After clicking the Copy Selected Items button, you will have the choice to Create a New List using the selected items, or to Copy the Items to an Existing List. Choose the option you prefer. If you choose to create a new list, on the following page you will enter a name for it. If you are copying to an existing list, the next page will let you choose the list to which you'll add the items. The list will then be saved. You may alter quantities, send the list to your shopping cart, or browse the Products section to add more items to the list. Next, select the Featured List you would like to copy so that you can add items to it. Both methods require you to Login to your account, then use the Products search to find items you want to add to the list. (1) You can add as many items as you need to your shopping cart, then view your shopping cart and use the Save to Custom List button to add the items to a new or existing Custom List. (2) You may also add items (one at a time) to a new or existing Custom List directly from the Products section. For each desired item, enter a quantity next to the 'Add to Cart' button and click the Add to Custom List link (located to the left of the Quantity box). Login to your account and click Custom Lists on the blue navigation bar at the top of the screen. Click the "Create New List" link at the top of the main Custom Lists page. Enter a name for your new list and choose a Sub-Account (or All), then click "Save." Follow the directions on the following screen to add items to your new custom list. Login and go to Custom Lists. On the list's details page, click Modify this List at the top-right of the page. Next, click Delete this List in the upper right corner. Note: If the list has no items on it, the details page will have a 'Delete' option. Login and go to the main Custom Lists page. Click the Copy Existing List link at the top-right. Next, select the list you would like to copy. The following page will let you pick and choose which items you would like to copy from the selected list. Use the checkbox in the header at the top if you want to select all of the items at once. After clicking the Copy Selected Items button, you will have the choice to Create a New List using the selected items, or to Copy the Items to an Existing List. Choose the option you prefer. If you choose to create a new list, on the following page you will enter a name for it. If you are copying to an existing list, the next page will let you choose the list to which you'll add the items. Click "Modify this List" at the top-right. On the Modify page you have complete control over the items on your list. FAQ: How do I add items to a list? How do I order from my Custom Lists? Go to your Cart and continue through the usual checkout process. What are Custom Part Numbers? How do I add Custom Part Numbers? Can I upload Custom Part Numbers from a Spreadsheet? How do I save a spreadsheet as a .CSV file? Why do I have to "validate" my custom part number entries? How do I change/modify a Custom Part Number? How do I delete a Custom Part Number? Don't see what you're looking for? Try the Custom Part Numbers Help Page. Our Custom Part Numbers feature allows you to set up your own part numbers to correspond with Elliott catalog numbers on our website as well as on printed invoices. You can add your custom part numbers directly from our Products section by entering your part number for each desired item, or you can use the Rapid Entry or Spreadsheet Upload options available from the Custom Part Numbers section. Once you've loaded your part numbers, every time you're logged in you will be able to search our products using your own Custom Part Numbers. 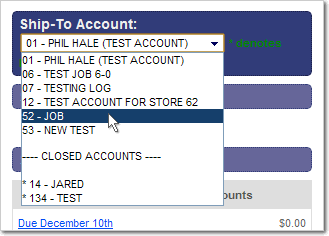 You can also use your part numbers in our 'Rapid Entry' forms and other creation methods for orders, quotes, or custom lists. These numbers also show up alongside Elliott part numbers in many places on our site, including your invoices. You can toggle these off and on depending upon your needs. Find the item(s) in our Products section, select the item so its details page opens, and click the "Add Custom Part Number" link, which will prompt you for a part number and description. On the main Custom Part Numbers page, use the Rapid Entry form to quickly match your own custom part numbers to our catalog numbers by entering the data side-by-side (more help). Click the Upload Spreadsheet button and follow the on-screen directions. If any entries are invalid or duplicates, you will be prompted to fix any issues that were found. You can create CSV files in most spreadsheet programs, such as Microsoft's Excel. Open the table containing your desired data in Excel (or a similar program). On the main menu, Click on "File," and select "Save as..."
On the Save screen you will see a place where you can switch the "Save as type:"
Click on the small downward arrow button to expand the 'Save as type:' drop-down menu, and select "CSV (Comma delimited) (*.csv)" from the list of file types, as shown in the example below. Give the file a meaningful name, and make sure that you retain the .csv filename extension that was put in there for you. When you upload a spreadsheet containing custom part numbers, or submit them in our Rapid Entry form, you may have to validate certain entries that have conflicts. This may happen because some of the Elliott part numbers you uploaded did not match up with our system (i.e., the Elliott part numbers you entered do not exist), or it may also occur when you already have an existing custom part number for one of your entries. If the issue is a non-existent Elliott part number, you can go back and amend the number if you think it contains a typing error, or you can enter detailed information about the part that you wanted. If the issue is a duplicate or pre-existing custom part number already saved on your account, you are given the choice to use the existing part number or your new entry. Only one custom part number can be saved for each Elliott product. We have thorough error/exception checking in place to prevent as many errors as possible and ensure the accuracy of your Custom Part Numbers. Maintain Custom Part Numbers allows you to search the products for which you have already loaded your own Custom Part Numbers so that you can edit/change your Custom Part Number and/or description. From the Custom Part Numbers main page, you may use the search tool in the Maintain Custom Part Numbers section to search your existing Custom Part Numbers by Keyword, Custom Part Number, Elliott Part #, or Manufacturer/Brand. Click the Maintain hyperlink to show a list of all of your Custom Part Numbers. Simply click the "Edit" link next to any part number in the list and you will be able to enter new text for the Custom Part Number as well as the Description. Do this for as many of the items as necessary. Be sure to click Save All Changes (at the top of the page) when you are done. Search for the part number(s) you want to delete by using the search options in the "Maintain Custom Part Numbers" section of the main Custom Part Numbers page, or, if you want to choose from a complete list of your custom part numbers, click the Maintain link (found in the same section of the page). This will load a list of your Custom Part Numbers, filtered based on your search entry (if any). Click the Red/White "X" button on the far left side of each Custom Part Number you would like to delete. When you click the "X" a checkmark will appear in its place, but this does NOT mean the part number has been deleted yet. Click "Save All Changes" (at the top) once you have finished selecting all of the items you wish to delete. If you accidentally select an item, you may click it again to deselect it. When you click "Save All Changes," all Custom Part Numbers marked by green checkmarks will be deleted.